Obama in Camden: The president to announce ban on local police using federal funds for military weapons. 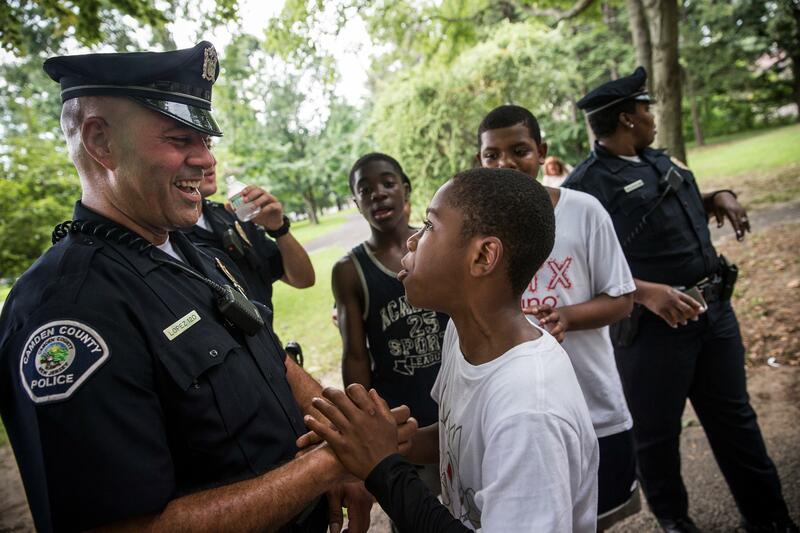 Officer Jim Lopez of the Camden County Police Department talks to Omar Headen, age 13, during a day of action organized by the CCPD, on Aug. 22, 2013, in the Parkside neighborhood of Camden, New Jersey. President Obama is traveling today to Camden, New Jersey—until recently considered the most dangerous city in America—to unveil a vision for improving relations between law enforcement agencies and the communities they’re supposed to protect. The measures Obama is set to announce include new limits on the types of military equipment that police departments are able to buy with federal funds. (The ban will apply to the purchase of grenade launchers, tanks, weaponized aircraft, and .50-caliber-and up ammunition.) The president will also announce a new data-gathering initiative involving 20 cities, including Camden, whereby local police forces will collect, analyze, and release data on traffic stops, use of force, and other kinds of interactions between police and civilians. Why Camden? The reason the Obama administration chose the New Jersey city as the site of the president’s big law enforcement speech is that it is seen by policymakers as a model for how a worthless and dysfunctional police department that is hated by residents can be turned into a force for good. Long crippled by rampant open-air drug markets, a flood of illegal guns, and a murder rate that was at one point roughly nine times the national average, the city has since seen an extraordinary turnaround: According to statistics from last August, shootings had fallen 43 percent over two years, and violent crime more generally was down 22 percent. The number of murders went from a record 67 in 2012 to 54 in 2013 to 32 last year. The undisputed catalyst for these encouraging developments was an extraordinary 2012 decision by city officials to summarily disband Camden’s local police department, and replace it with a county-level agency unencumbered by long-standing union contracts. [G]enerous union contracts have made it financially impossible to keep enough officers on the street. So in November, Camden, which has already had substantial police layoffs, will begin terminating the remaining 273 officers and give control to a new county force. The move, officials say, will free up millions to hire a larger, non unionized force of 400 officers to safeguard the city, which is also the nation’s poorest. By the following summer, the new agency had hired 411 officers, up from 250, without increasing its budget, and brought on a staff of 120 civilian clerks and analysts to run a new intelligence center equipped with surveillance cameras and ShotSpotter microphone technology that alerts police whenever a gun is fired. Though the person in charge of the new agency, Chief J. Scott Thomson, had been in charge of the one it replaced—and though about 150 officers who worked for the Camden police department got jobs with the county force—the culture among the rank and file changed quickly, with a new emphasis from the top on building trust with community members. Officers have been moved from desk jobs and squad cars onto walking beats, in what Chief J. Scott Thomson likens to a political campaign to overcome years of mistrust. Average response time is now 4.4 minutes, down from more than 60 minutes, and about half the average in many other cities. The number of open-air drug markets has been cut nearly in half. In his speech today, Obama will likely present the transformation of Camden as a model for law enforcement agencies around the country that are facing distrust from the public and grappling with runaway crime rates in poor communities. In so doing, the president will implicitly be endorsing the rather radical move that opened the doors to progress in Camden—one that was vehemently and predictably opposed by police unions. It’s unclear, at this point, whether officials in other cities will be able to take such bold action, and whether the rip-it-up-and-start-again approach that seems to have worked in Camden will be replicable elsewhere. Fewer grenade launchers, in the meantime, can’t hurt.